Probably the most famous species in the genus, this is the one that Darwin postulated would be pollenated by an unknown moth with a proboscis long enough to use the long nectary on these flowers. Everybody has to have one of these. Elegant. 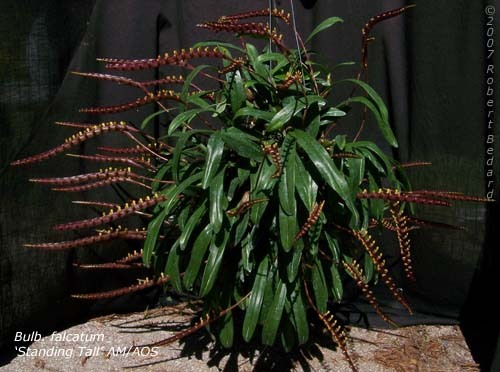 Wild small stature Bulbophyllum with a bright red rachis, and chromium yellow flowers for a striking contrast. Just fantastic when in flower, flowering lasts for weeks. Grows like a weed, will fill a four inch basket in two years. (I grew 24 bulbs from two in two years; the plant below is the same plant after three years.) These are grown in New Zealand Sphagnum in plastic Vanda baskets, I hang them up in the rafters where it is warm and bright. A wild flower, spotted like a fawn. Another one that grows like a weed for me. This species flowers on and off all year for me, with several flowers at at time, but no big flush of flowers like some of the other species. Another one that seems to prefer warmth and reasonably bright light. Keep wet. 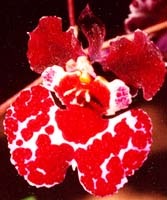 The regular color form of this cute rambling species, this has whitish flowers with red to purple spotting. Easy grower. A classic Bulbophyllum. Awesome golden-orange flowers with maroon spotting on the backside, that last for weeks. Has a spicy fragrance that is not exactly delightful, but not nasty, either. This thing grows like a weed, rapidly becoming large specimen plants. These are grown in New Zealand Sphagnum in clay pots, I hang them up in the rafters where it is warm and bright. 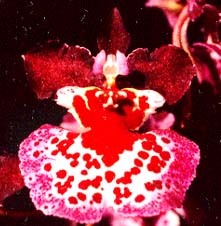 A division of Alan Koch's plant. 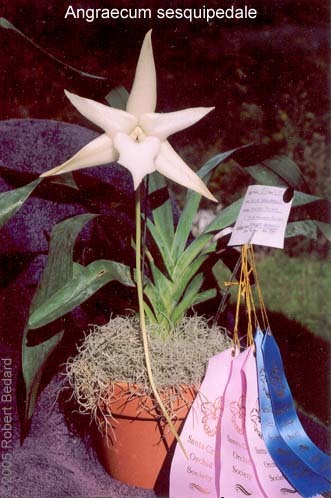 Very unique club-shaped pseudobulbs with long many flowerwed infls. Takes very bright light to flower well. This is one of the needle-leaf types with very narrow, sharply-pointed leaves. Very distinctive growth habit. Elegant. Seedlings from a cultivar that earned two cultural awards for it's owner. This is an heirloom variety of the Bean-leaf type. Very attractive, compact plants. Shorter flower spikes and wider floral segments than typical falcata. Fragrance of Apples. Divisions of a selected cultivar. This cool-growing Phal relative experiences light frosts in nature; I grow this outside for most of the year. 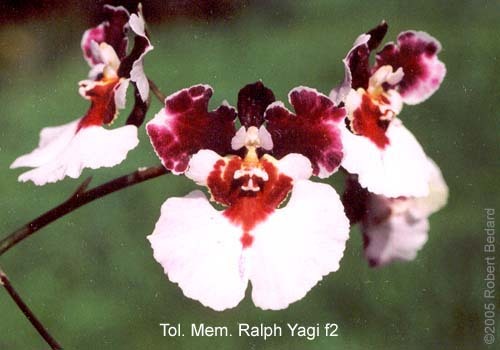 A selfing and a sib of two very red Ralph Yagis, virtually no yellow on either of these clones. Three quarters of the seedlings are so nice that I don't want to sell them ... so I remade the cross this year. Most flowers are red and white, a few have pink on the lips, a very few have a hint of yellow color. Quite a few have lips that open white, and then slowly develop a peppering of tiny red dots that slowly coalesce, until the entire lip is pink. These end up being large plants for Tolumnias. These are growing in dolomite and charcoal in 1.75 inch clay pots with wire hangers that let them get all the warmth, light and air movement that they like. There are example pictures of a few more of these in the Photo Gallery under Misc. Genera. Absolutely the best Vanilla I have ever grown, this one flowers readily. 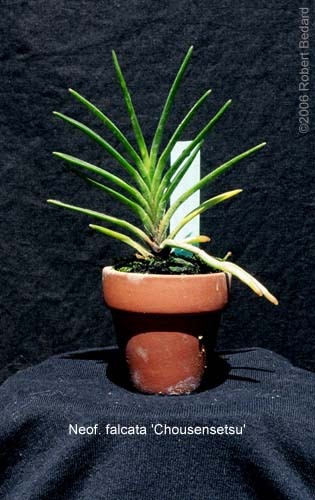 A monsterous plant, with a stem that gets thicker than your thumb, and very robust leaves up to 12 inches long. Flowers are large and yellow, flowering season is extended under high enough light. Originally acquired from the Fordyces, so if you have seen their Vanilla, this is it. Absolutely fantastic. Really needs high light, warmth and plenty of space to do well. Mine is up in the rafters at the warmest end of my warm house. Larger, rooted plants are often available at our nursery, but they do not ship well.